The A10-7870K is a 95W Kaveri APU compatible with AMD's Socket FM2+ platform. 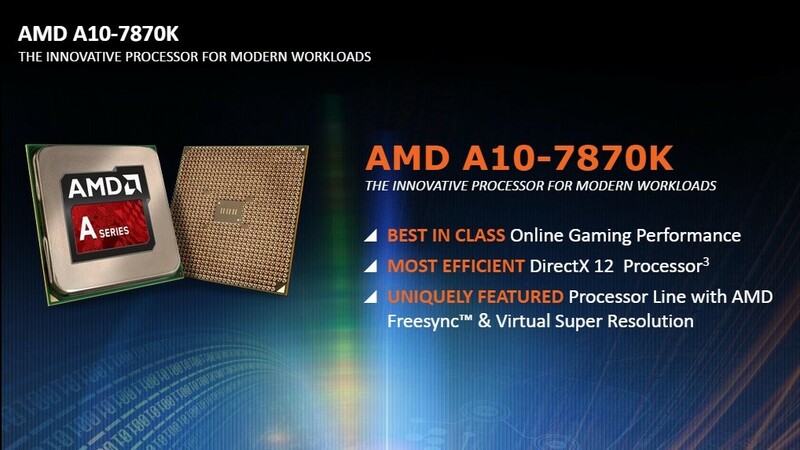 Like the A10-7850K, AMD's previous flagship Kaveri offering, the A10-7870K comes with four 'Steamroller' CPU cores, 4 MB of L2 cache, DDR3-2133 support, and eight Radeon GPU 'cores' based on AMD's GCN architecture. Compared to the A10-7850K, the A10-7870K sees clock speeds raised across the board. The CPU is now clocked at 3.9 GHz with a turbo frequency of 4.1 GHz, up from 3.7 and 4.0 GHz respectively on the 7850K. The GPU also gets a healthy 20 percent clock speed boost, jumping to 866 MHz (from 720 MHz) across 512 shader processors, 32 TMUs and 8 ROPs. AMD was quick to compare the A10-7870K against a similarly-priced Intel CPU, the Core i3-4370. As always you should take results like this with a grain of salt, but in AMD's data they show the A10-7870K slightly outperforming the i3-4370 in CPU-heavy workloads such as PCMark 8, and completely dominating in compute workloads like 3DMark thanks to far superior GPU performance. Even when the i3-4370 is paired with an $80 graphics card (Nvidia's GeForce GT 740), the A10-7870K performs better in popular games such as Dota 2, League of Legends and StarCraft II. AMD's APU also supports features such as FreeSync and DirectX 12, and comes fully unlocked out of the box. The A10-7870K goes on sale today for $137, which is less than Intel's $150 Core i3-4370. AMD says that the APU delivers "Core i5 performance at Core i3 pricing", making it a compelling option for those looking to build an entry-level gaming rig.